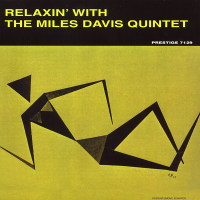 Relaxin' With the Miles Davis Quintet was the second of four releases resulting from Davis' famous May and October 1956 marathon sessions. 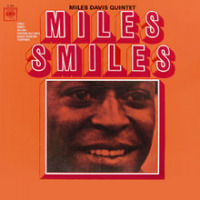 The other three recordings were Cookin' with the Miles Davis Quintet (1957), Workin' with the Miles Davis Quintet (1959), and Steamin' with the Miles Davis Quintet (1961). All of the music from these sessions would eventually collected and released on The Legendary Prestige Quintet Sessions (2006). Chronologically, Relaxin' shows up between Bag's Groove (Prestige, 1957) and Miles Davis and the Modern Jazz Giants (Prestige, 1959). "Long before Miles Recorded "Time After Time" and Stanley Crouch excoriated him for having the vulgarity to praise Prince, Miles was recording his own versions of pop tunes. His first classic quintet played "Surry With the Fringe on Top," and "If I Were a Bell," and by doing so transformed them into jazz standards. 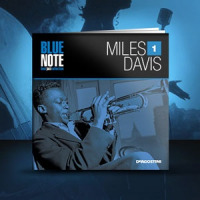 He played those songs because he liked them and could do something with them, and because jazz has always used contemporary pop music for its own purposes, in part because the musicians had their ears open to what everyone was listening to, and also because many of them have earned a living, or something like it, by playing pop music in other bands and situations. This is the recording where Davis introduced "If I Were a Bell" into the jazz vernacular, not to mention, "I Could Write a Book," and "It Could Happen to You." 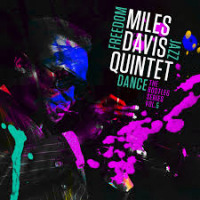 Davis was moving on from the bebop book of "Embraceable You," "How High the Moon," and "I Got Rhythm," into the new hard bop realm, this recording being one of the key releases. Two of the six selections were recorded at the May 11th session, with the remaining four coming from the October 26 session. When Davis plays bebop standards, such as "Woody 'n' You." He does so in the new, sharper, more defined hard bop style. John Coltrane is as essential to this sound as Davis, his tenor approach exploratory within the confines of the standard composition. 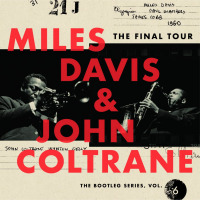 Where Davis is expanding the volume of space in which he carefully places his precisely selected notes, Coltrane embarks on harmonic expeditions reaching far beyond the original intentions of the composers. Red Garland rolls out block chords while Chambers and Jones keep Elgin time. 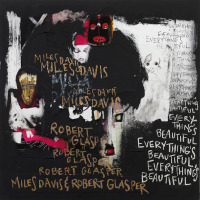 By the time the pieces were recorded, Davis had honed hi ensemble into a crack small jazz unit. That he went from here to his sextet and then to an arguably greater quintet with Herbie Hancock, Ron Carter, Wayne Shorter, and Tony Williams is testament to his importance to American culture. Hear here, Davis at the pinnacle of his considerable powers, transforming even the simplest of melodies into sonic gossamer. Critic's Note: Anno Domini 2017, marks both the 100th Anniversary of recorded jazz, deftly noted by the release of the Original Dixieland Jazz Band's shellac "Dixieland Jass Band One-Step (A)/Livery Stable Blues (B)," Victor 18255, recorded February 26, 1917 and released March 7, 1917. My father was 18 months old and my mother was yet to be born for two years. It is also the twentieth anniversary of me writing for All About Jazz. The first recording I reviewed for the magazine was Art Pepper's San Francisco Samba (Contemporary, 1997), published December 1, 1997. I am using this present review as part of a series noting my twentieth anniversary with the magazine and paying special tribute to my fellow writers at All About Jazz and Publisher Michael Ricci. Track Listing: If I were a Bell; You’re My Everything; I Could Write a Book; Oleo; It Could Happen to You; Woody ‘n’ You. Personnel: Miles Davis: Trumpet; John Coltrane: tenor saxophone; Red Garland: piano; Paul Chambers: bass; Philly Joe Jones: drums.